As you may be aware, in September 2011 the revised primary school curriculum was introduced to include essential skills for life and learning. Financial capability is included as part of ‘mathematical understanding’ which contains a section on money and a section on economic wellbeing. These changes are designed to teach the next generation how to save, budget and manage their money in the future so the country’s economy is healthier. To support these changes and to help the children to understand the basic principles we have our very own savings bank! Your child can open a Woodford Valley School Savings Account with as little as £1 and with their first deposit they will receive a free gift – a smart ‘Woodford Valley money box’. 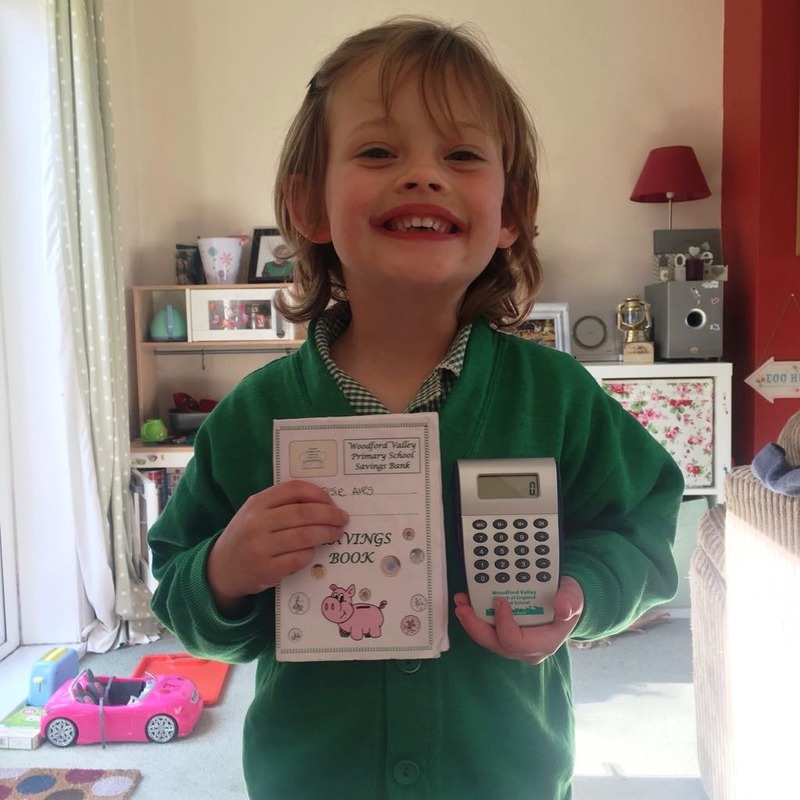 To encourage them to save at home they will also receive a reward chart; this is designed to keep at home to record the money that goes into their money box which they can earn for good behaviour or helping in the house. Your child’s money will be held in an HSBC Current Account and will not receive interest at the current time but may do so in the future. They will, however, receive a free Woodford Valley calculator when the account balance reaches £50 and a Woodford Valley wallet when it reaches £100. The bank is open on a Wednesday at morning playtime (10.10-10.30) when they can deposit, or withdraw, their hard earned cash using their very own Savings Account book. The bank is run by pupils (overseen by the office) which is another fantastic way of learning about money! Ask your child to come to the bank for an application form if this is something they would enjoy and they will be trained as a junior banker! If your child would like to open an account please fill in the application form with them and return it to the school office. You can help support these changes at home too; here are some tips to help teach your child about money. Set them weekly tasks and reward them with some coins for their money box. When they have built up a few coins, ask them to count it and take a trip to the school bank to pay it in. Involve them in your own banking – explain how internet banking works, ask them to help you transfer some money and visit the bank to pay cheques in – all of these activities can ignite their appetite for saving. Set goals – if your child wants a specific item like a PlayStation or IPod, explain how long it might take them to save up for it – you could also set incentives like helping out with the housework/washing the car or selling some of their unwanted toys in exchange for money towards their item. Make learning about money, budgeting and spending fun and start early! Just like learning a foreign language, if they learn from a young age, they’ll gain an integral knowledge of money that will enable them to make sound financial decisions in later life. Keep a record of savings – depending on your child’s age, you could make a wall chart explaining how much they’ve paid in and the amount they need to reach to earn their next free gift or let them take full control of their savings book – keeping it in a safe place for each time you go to pay in money. Help them to understand interest – as your child gets older you could start to discuss interest and how it helps money to grow whilst it’s in a bank account. Show them statements with displayed interest or help them to get to grips with it at home by paying them a weekly interest rate on any money they have in their money box. Consider an allowance – this can help children to learn how to manage their money and (with your help!) spend it in the most appropriate way. Base payment of the allowance on some clear cut rules such as cleaning their bedroom on the weekend, making their bed each day and helping out with household chores. These are just suggestions, you may have own ideas for encouragement.